New Scientist magazine has an article about Hojun Song DS1SBO and his Open Source Satellite Initiative OSSI-1 CubeSat. OSSI-1 is planned to launch in the 2nd quarter of 2013 into a 575 km 63° inclination orbit on a Soyuz-2-1b rocket from the Baikonur launch facility in Kazakhstan along with the Bion-M1, SOMP, BEESAT 2, BEESAT 3 and Dove-2 satellites. The Soyuz-2-1b launch had originally been planned for August 2012 but was delayed. 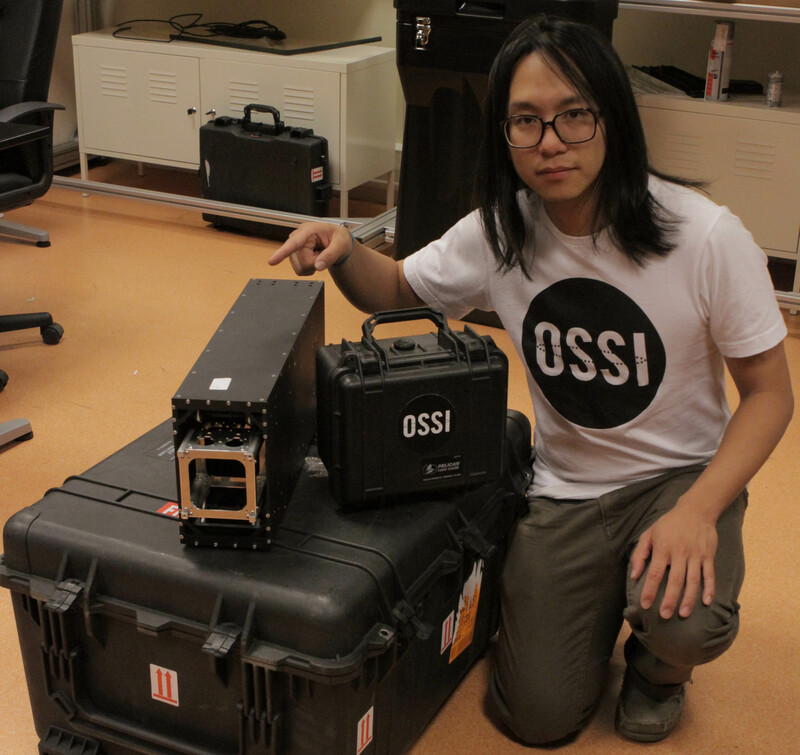 Korean artist Hojun Song DS1SBO has traveled to Malmö in Sweden to give a presentation about his innovative amateur radio CubeSat OSSI-1 to the Media Evolution Conference taking place August 22-23. European Space Agency (ESA) astronaut of British nationality Tim Peake is encouraging school children to get fit and stay active at the Farnborough International Airshow this week. Budding young astronauts aged 8 to 13 from across the UK are invited to take part in the international challenge Mission X: Train Like an Astronaut – a programme to encourage school students to focus more on fitness and nutrition. The programme developed by the partners of the International Space Station (ISS) uses astronaut training to teach how good diet and exercise play an important role in human performance in space and on the Earth. The programme is free and the activities can be used by individuals, schools or community groups. The international challenge will start in January 2013. Tim Peake is taking a short break from his own astronaut training to attend the Airshow and invite schools to participate in the Mission X: Train Like an Astronaut 2013 challenge. At Farnborough Airshow Tim spoke to teachers, students and families about his own astronaut training and challenged them to take part in the astronaut fitness programmes available as part of Mission X.
Tim as well as being a test pilot and ESA astronaut is also a keen runner, skier and scuba diver. 4000 UK students from over 44 British schools have already taken part in the Mission X challenges in 2011 and 2012. Students had the opportunity to take part in live link-ups with the International Space Station and find out about life in space. As well as Tim Peake, Mission X UK has been supported by ESA astronauts Andr Kuipers and Paolo Nespoli, NASA astronaut Piers Sellers and private astronaut Richard Garriott. People have been flocking from around the world to visit the UK Space Agency in the Space Zone at Farnborough. The latest industry developments and cutting edge technology are on display to demonstrate the work being done to layout the future direction for space. Space is a growing industry with a bright future. One of the ways the Agency nourishes and supports it is by inspiring the next generation of space scientists, engineers and enthusiasts. The next Mission X challenge will be launching in January 2013 – with the expectation of doubling the intake from 4000 to 8000 students across the UK. To find out more about how your children or school can be involved, register your interest. The Women in STEM High School Aerospace Scholars (WISH) project is sponsoring two six-day summer camps for rising high school seniors that should feature a presentation by astronaut Shannon Walker KD5DXB and an Amateur Radio contact with the International Space Station (ISS). Eighty-four female high school students from 29 states will plan a simulated mission to Mars and experience life as an engineer or scientist when NASA’s Johnson Space Center in Houston hosts two events focused on science, technology, engineering and mathematics (STEM) in June and July. The young women will work in teams with female NASA mentors to develop mission plans for launching to Mars, living and working there, and integrating the many components necessary for a successful planetary mission. They will work within the confines of a fictitious budget and build several small mockups of vehicles to demonstrate a successful launch and landing of the Mars spacecraft. Young women participating June 24-29 will hear a first-hand account of life in space from NASA astronaut and radio amateur Shannon Walker KD5DXB. Participants July 8-13 will have a chance to speak with a current space station astronaut via ham radio as part of the Amateur Radio on the International Space Station program, a NASA educational initiative that facilitates direct links between students and astronauts. The young women were selected based on completion of interactive, online lessons focused on space exploration and mapped to national education standards, academic merits and geographic diversity. The WISH program encourages young women to pursue science, technology, engineering and mathematics degrees and exposes them to the real-world applications of STEM careers at NASA. This program is in its second year. It began as a NASA accompaniment to the White House Council on Women and Girls.